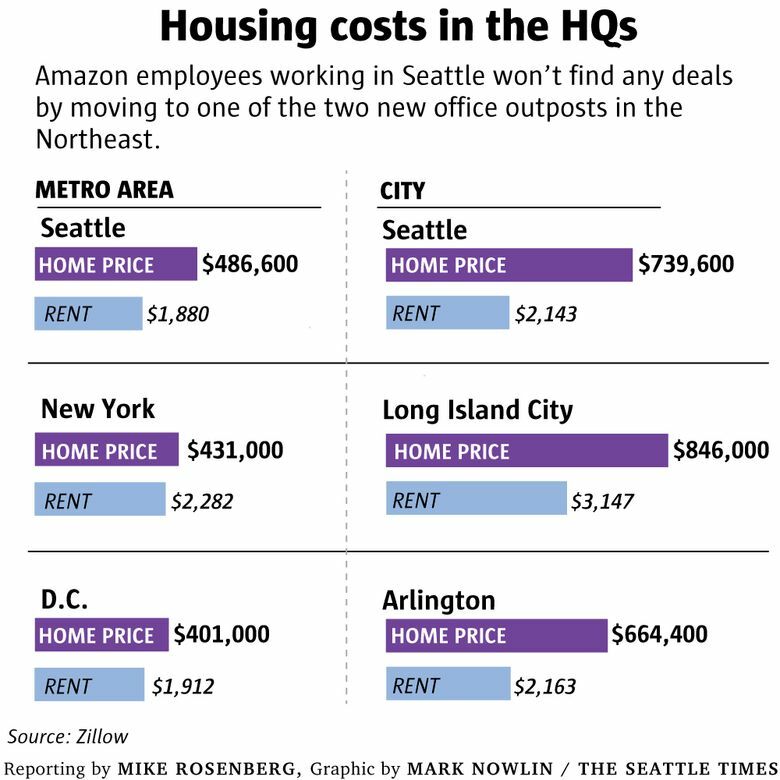 Probably not, at least not in the next couple years: Amazon still plans to add the equivalent of an HQ2-sized office expansion in Seattle, and the new outposts it picked are so pricey that they offer employees here no financial incentive to flee the city. Priced-out Seattleites hoping for a housing market crash with Amazon expanding to two new “headquarters” locations might be disappointed. • Amazon already plans, essentially, to add another HQ2 here, as well: The company said it expects to add about 4 million square feet of office to both Long Island City, New York and Crystal City, Virginia, the HQ2 picks it announced Tuesday morning. But based on plans already underway, Amazon already is committed to adding another 4 million in Seattle over the next several years — plus more in Bellevue. • Amazon has 8,200 full-time jobs open in Seattle right now. For perspective, last month about 3,200 unemployed people in King County began actively searching for jobs. • Some Amazon workers here have been sitting out of the housing market recently to see where HQ2 lands, for good reason: In about two-thirds of the 20 finalist cities, you could get a mansion for the cost of a Ballard bungalow, or a starter house for the price of a little Kirkland condo. But Amazon ultimately chose the New York and Washington, D.C. areas, two of the most expensive places in the country, with no cost savings compared to Seattle. The fate of Amazon here is pivotal to the local housing market. Amazon has added at least 40,000 employees in Seattle since 2010 — that’s equal to about 30 percent of total net job growth in the city this decade. The average employee makes six figures, the type of salary that allows people to bid up home prices and afford fancy new apartments. In the rental market, in some recent years Amazon alone has added as many employees as the city has added apartments, even amid a record construction boom. Since Amazon’s growth spurt started in 2010, home prices in Seattle have soared 80 percent while rents have grown 69 percent, both among the biggest in the country. The big questions affecting the level of local housing competition: whether Amazon employees here flee to one of the HQ2 cities, and if future hires that would have been destined for Seattle instead go to one of the new outposts. It’s still unclear how many current and future employees may be able to choose between Seattle and the two new offices. But in any case, for those workers who can pick their job location, the cost of living will be about the same at all three. Looking at the broader metro areas, the median house costs about $400,000 to $450,000 across the Seattle, New York and D.C. areas, while the typical apartment rents for $1,900 to $2,200 a month in each of the three regions, according to Zillow. In the actual cities expected to host Amazon’s main offices, home prices are higher but still in the same ballpark of one another, ranging from $664,000 in Arlington (home to the Crystal City neighborhood) to $740,000 in the city of Seattle to $846,000 in Long Island City. However, rents are considerably higher in Long Island City (about $3,100 a month) than in the cities of Seattle and Arlington (both are about $2,100). Looking at the 20 finalists Amazon picked in January for the second headquarters, New York and D.C. have among the priciest housing costs, along with Boston, Toronto and Los Angeles. In most finalist cities, workers could have gotten the median home for half the price of one in Seattle, including in Dallas, Austin, Atlanta, Chicago, Pittsburgh, Philadelphia, Nashville, Raleigh, Newark, Miami, Indianapolis and Columbus. “The fact of Amazon choosing a second (and third) HQ is less important for Seattle’s housing market than their pace of hiring in Seattle moving forward, particularly since they picked two markets that are arguably pricier than Seattle,” said Aaron Terrazas, senior economist for Zillow. Of course housing prices aren’t the only factor when Amazon employees, or anyone else, choose where to live. But even on good Amazon salaries, it’s becoming a lot tougher to afford a home in Seattle. The average Amazon employee in Seattle makes about $110,000, according to an analysis of worker data posted to Glassdoor. 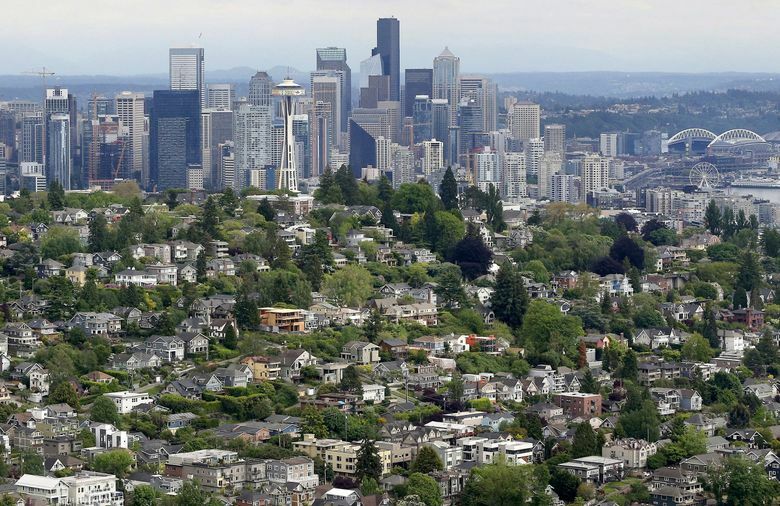 But in recent years, the household income required to afford the median house in Seattle has crossed over that threshold — from about $88,000 three years ago to $134,000 now. A few Amazon employees interviewed for this article, who declined to have their name printed because Amazon typically does not allow employees to speak to the media, generally said they were disappointed with the HQ2 choices. “Although we have a lot of Amazon homeowners/buyers and sellers, they aren’t all of our market,” Molinaro said. Even if HQ2 has no immediate impact on the Seattle housing market, it certainly could in the long term if it means Amazon ultimately chooses to channel its growth elsewhere. Right now, Amazon has 10 million square feet of office space spread across South Lake Union and the Denny Triangle. It has plans to reach 14 million square feet, mostly in buildings under construction now that it either owns or has committed to lease. Amazon also has two big offices in Bellevue — one open, and one forthcoming — that would fit about 4,500 employees. The company hasn’t said whether it will keep growing here beyond those plans, which figure to keep Amazon’s expansion chugging along here for the next few years. But if it does stop there, it’s unlikely other companies would be able to pick up the hiring slack. Amazon is several times bigger than any other company in the city, and even with out-of-town stalwarts like Facebook and Google expanding in South Lake Union, they remain less than a tenth the size of Amazon here. Amazon’s announcement Tuesday morning didn’t provide a lot of illumination on its plans beyond the next several years; it only notes its current employee count in Seattle and that it continues to hire here. But it does say that both its new East Coast expansions could ultimately double in size to 8 million square feet of office space each. Jay Carney, an Amazon senior vice president, reiterated that hiring continues in Seattle and that employees here will not be required to transfer to any of the new locations. Read more about Amazon and its HQ2.